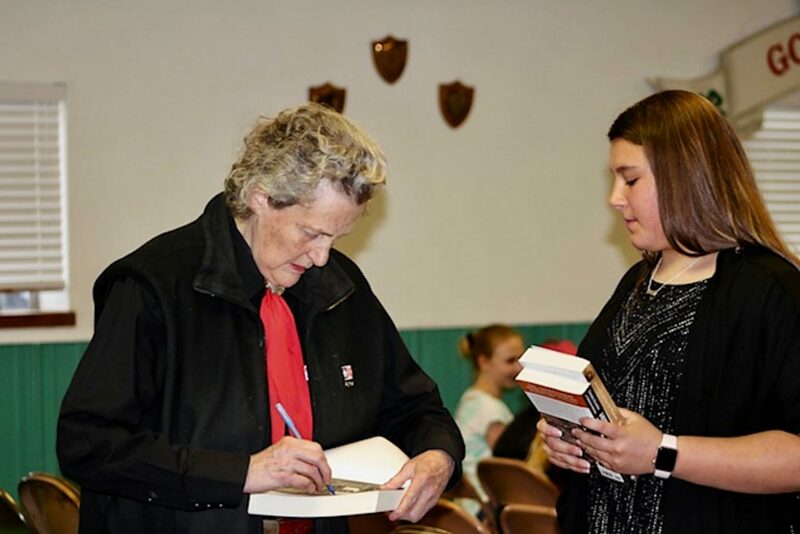 Grandin at Adams County, Colorado, Good Luck 4-H Club event, An Evening With Temple Grandin, on April 7. 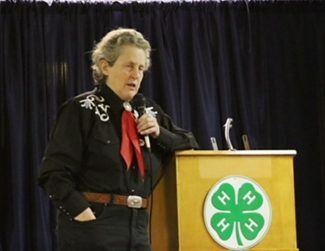 Grandin speaks to attendees at the Good Luck 4-H Club in Adams County, Colorado, event, An Evening With Temple Grandin, on April 7. Grandin signing a copy of one of her books for Payton Porterfield a member of the Good Luck 4-H Club in Adams County, Colorado. On April 7, Temple Grandin spoke to nearly 200 people at the Adams County, Colorado, Good Luck 4-H building. Grandin spoke for about an hour about her experiences with autism, animal behavior and the importance of future generations working in careers such as construction. "Its been an interesting journey for me learning how my thinking is different" Grandin said as she explained that by being observant and a visual thinker allows her to see things that affect animal behavior that others don't see. 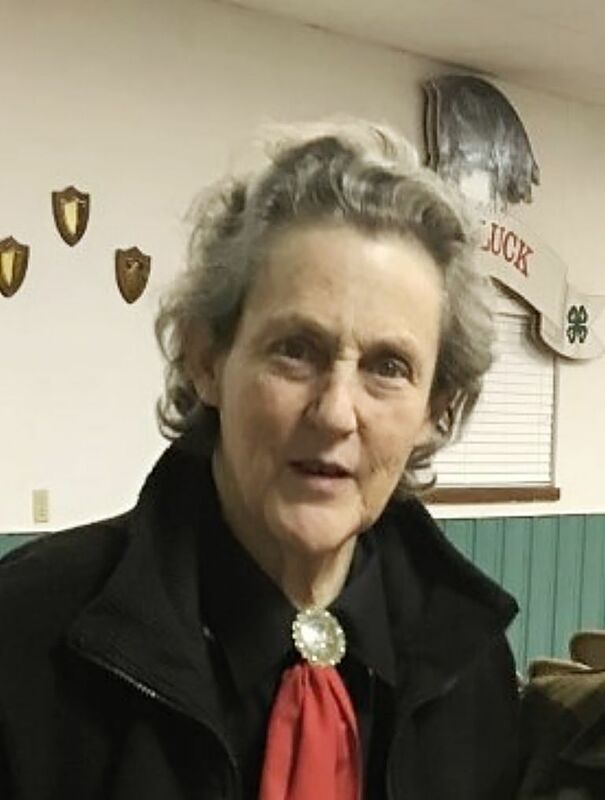 Grandin shared stories from her life including her cattle pen designs for more humane treatment, how she fixed cattle not loading into a chute with simple tape and seeing a raccoon on the Mars launch pad and wondering what trouble it was causing. Living a sheltered life causes more distress to animals experiencing new things or places then to those animals that have been exposed to more things. This is not only true for animals but also people living with autism, according to Grandin. "Sudden novelty scares" said Grandin as she showed a picture of a cowboy on the ground next to a scared horse with its saddle falling to the side. A change in an autistic person's schedule can cause just as much distress. 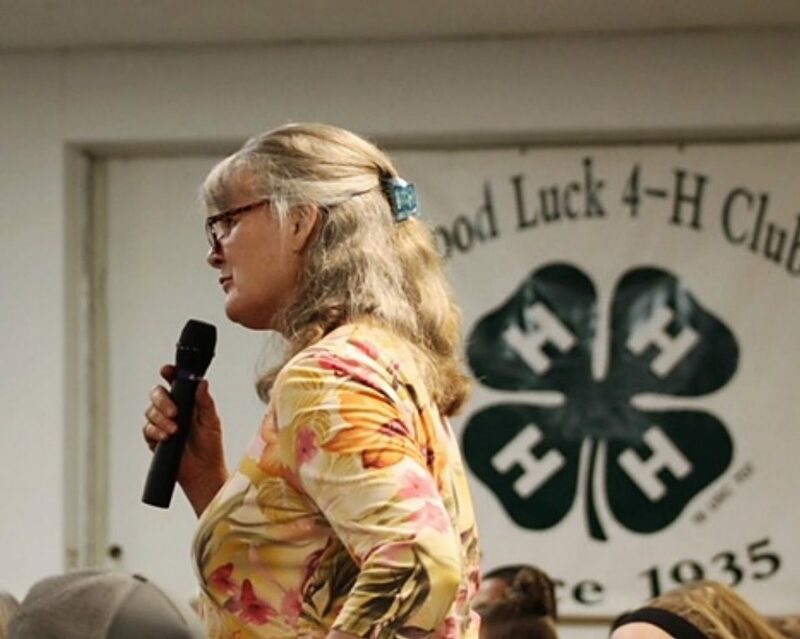 Included in the audience was Debbie Pech Ritch, former Adams County Fair and Rodeo Queen and Good Luck 4H club president, who traveled from Washington just to participate in the event. Ritch said that she grew up around cattle and saw the Temple Grandin movie about six years ago. "I just love Temple Grandin," Debbie said as she explained why she couldn't pass up the opportunity to hear Grandin speak. Barnes and Noble was on site with a selection of books written by Grandin, which she signed as she chatted or posed for pictures with the attendees. The evening ended with everyone enjoying an assortment of cookies and drinks. Grandin herself took a brownie for the drive home.